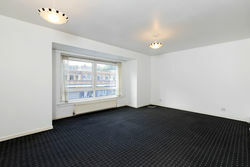 Immaculately presented spacious first floor level flat . 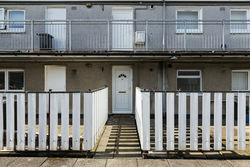 The property is entered via glazed UPVC door to a well proportioned L shaped entrance hallway, four useful storage cupboards and access off to all apartments. To the front of the property is an impressive sized lounge/dining room with box bay window formation and two good sized bedrooms, the master having fitted wardrobes providing excellent shelf and hanging space. 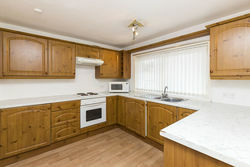 Overlooking the rear is a modern kitchen extensively fitted with a range of wall and base storage units. 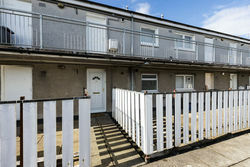 The accommodation is completed by a rear facing shower room. Externally there is an enclosed drying area at the rear of the property and store. Entry to the building is by security door (39B). 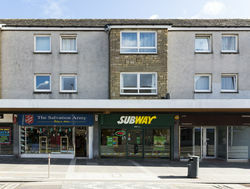 The property is located in the heart of the Kirkintilloch area and is conveniently placed for access to numerous local amenities including schools at both primary and secondary levels, transport facilities and shopping on Kirkintilloch Main Street.